Understanding French Drains begins with the misconception of where they originate from. There is little that is French about French drain, because in fact it was both popularized and refined in the United States. In the USA, this type of drain was named after Henry Flagg French, the man who invented it and wrote a book about farm drainage published in Massachusetts in 1859. French drains were initially used to reroute water from a sloping piece of land, to where the water could be used somewhere else. French drains were also used to remove unwanted water from a high ground to a lower ground level. They were also quickly adapted for use in houses, barns, and residential buildings, to remove human and animal wastewater which often gathered in livestock areas and created a breeding ground for mosquitoes and flies. In modern days, French drains still serve the same purpose; they move water away from basements or areas near a home’s external walls, where it can promote mildew growth. There is nothing sophisticated about a French drain, although they have been modified over the years, making use of modern materials. Basically it is a gravel-lined ditch connected to a pipe that removes water away from a building, or around a building, or structure such as a wall. It prevents water from penetrating house foundations and damaging the walls. French drains can be installed both indoors and outdoors. Indoor French drains may go around the basement perimeter below floor level, while exterior installation requires digging below the foundation. Regardless of the location, it is best to cover the trench in a way that allows for future access for maintenance. 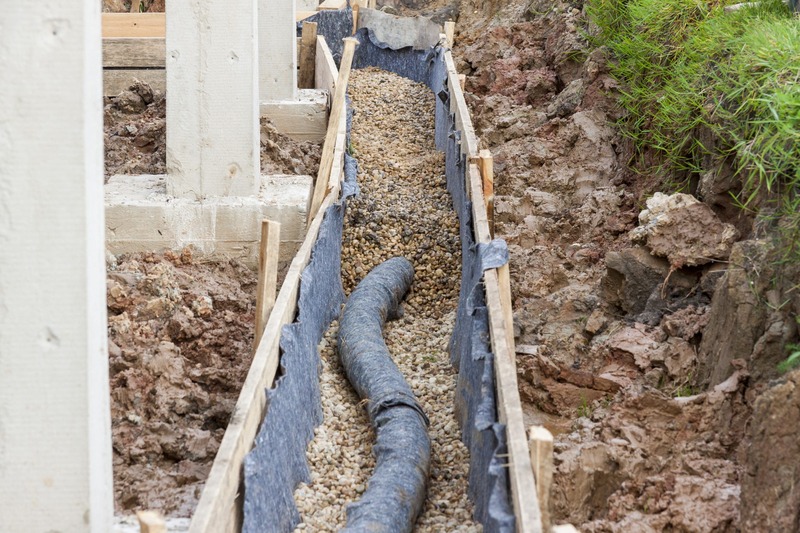 Installing a French drain is not a complex process, but it requires some specialized tools and materials to get the job done properly and quickly. It also requires an understanding of the concept to have a properly functioning installation. Outdoor and indoor French drains run on the same principles. The first thing to do is to dig a trench with a slope in the direction where the water should flow, as all drains work on the principal of gravity. For every five to eight feet long, it is generally recommended to create a minimum slope of one inch. To determine proper sloping, use a level string tied to stakes on both ends of the trench to measure distance from a reference point on the top to the bottom of the trench. Make sure you make enough room to install a large enough diameter pipe for effective water removal. For a typical residential home, 4″ diameter pipe is acceptable. A trench that is at least 12-inch width is the bare minimum, and the depth should be between 18 and 24 inches. When installing around a house foundation to prevent basement moisture, the pipe should be placed well below finished floor level. When your trench is ready, fill it with crushed stones up to few inches thick. To prevent weeds from growing or soil infiltration, line the trench with water-permeable landscaping fabric before placing the crushed stones inside the trench. The next step is to lay piping into the trench; you can use PVC with pre-drilled holes, or flexible drain pipe that has slits. PVC is the more expensive option, but it is easy to clean and unclog by using hydro jet or powered drain auger, and not a major expense. Flexible pipe is easier to work with, and less expensive as well. Opting for PVC means you have to use additional 45-degre joint at the start of the pipe line to allow for sloping. You can make the pipe stick out of the ground for easier access during maintenance. Put in mind that French drains work by allowing the water to enter the pipe from below, so the holes should face downward. Also keep in mind that plastic tends to float in water, so make sure to add ample stone on top of the pipe. Many French Drain installations are designed to empty the ground water into your house drain system. Because a French drain works on the principal of gravity, the end point of the drain may be lower than your house sewer or house drain. In these cases a sump and sump pump must be installed to pump the accumulated water up to the level of your house drain. Piping for a sump pump should include a check valve, and a trap. Any sump pump used should be equipped with an automatic float switch. After the pipe and crushed stone has been installed, finish wrapping the filter fabric around the top of the installation, but below the level of the floor. Filter fabric prevents roots and dirt from clogging the weep holes in the pipe, of blocking up the crushed stones. If installed inside a building, do not fill the trench with gravel to grade, always leave 2″ to 4″ to recement the floor. If installed out side a building or exterior wall, you can leave the stone a few inches below grade, and then add dirt to cover the remaining area of the trench. Of course covering the trench with soil makes it difficult for maintenance, but it completely conceals the trench from sight. • In case you don’t want to use landscaping fabric, use a flexible perforated pipe encased in water-permeable fabric. But always speak to a professional before choosing the correct filter fabric. • If you have to dig a long trench, you may want to consider renting a trench digger to get the job done more quickly. This is especially true if you live in an area that has rocky soil conditions. • In some cases you may opt to place a catchment barrel to harvest rain water at the terminus of the drain. It can be useful if you have garden. • Trenching removes large volume of dirt, so make a plan to get rid of the excess soil safely. Make a plan for this before you start digging. • Curtain drain: There is almost nothing different between a traditional French drain and a curtain drain, expect in terms of depth. Curtain drain works on shallower depth and are used primarily to channel water from a location where surface water is constantly collecting, such as in front of a retaining wall. • Filter drain: It drains ground water on the surface, such as removing a ponding condition, not underground water. • Collector/Interceptor drain: A trench is excavated to reach an impermeable layer of soil. A perforated drainage pipe is installed in the trench and covered with gravel to give way for water in the impermeable layer. It is primarily used to prevent groundwater from influencing slope stability. • Fin drain: The pipe for this drain can be perforated or non-perforated. Either type of pipe is installed vertically. Perforated pipe collects water from the composite that envelops it, while non-perforated pipe is fed directly by the composite material. When water runs into a gravel-filled trench, the perforated pipe in the trench allows water to come in and flow to the intended direction, as opposed to rising to the surface. Water can be diverted to other areas such as drainage ditch, dry well, street, or low area in your property. Because water always finds its way to the lowest points, the slope in the pipe helps to channel water. A French drain is effective if groundwater runs to your basement, one of your walls is facing a hillside, or surface water enters your driveway. Landscaping fabric (filter fabric) acts as a filter to prevent dirt and stones from entering the pipe, or clogging up the crushed stones. However, regular maintenance is still required to make sure nothing blocks the flow of water. If there is a change of direction or slope somewhere along the drain pipe, there should be a small access chamber where you can insert a rod, snake auger, or a high pressure water jet.